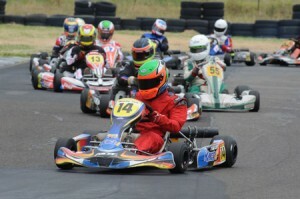 Second-generation racer Macauley Jones secured the biggest win of his flourishing career at the weekend when he took out the prestigious Brian Farley Memorial event at Sydney’s Eastern Creek International Karting Raceway. The event, held in honour of long-time AKA official Brian Farley, has become one of the major races on the calendar over the past few years. Jones, who only recently graduated to the senior ranks, beat home many of the country’s most experienced drivers to claim the win ahead of Sydneysiders Brett Robinson and Thomas Phillips. Despite facing a field punctuated by former Australian champions in only his second senior clubman event, Jones could not be fazed as he went up against the likes of former Australian champions Jason Hryniuk, Tyler Greenbury, Jason Burns, Matthew Waters and Chris Hays. The 16 year-old Albury driver won the opening two qualifying races before crossing the line tenth in the third heat to start on pole position for the pre-final. After a lengthy battle with Waters throughout the 12-lap encounter Jones proved superior aboard his Arrow kart to take the win. In the 20-lap final Jones was joined in a six-kart battle at the front of the field by Hryniuk, Hays, Phillips, Robinson and Steel Guiliana while fellow front-runners Waters and Nick Agland were eliminated on lap four. After no less than 15 lead changes between Jones, Hryniuk and Hays throughout the event, Jones made a last lap pass on Hryniuk to take a narrow victory. “To get the win in such a quality field feels great and really a huge relief to know that I can mix it with the best guys in the country,” said Jones. “It was a very hard race, everyone up the front is very tactical in the way the race but they also race hard and for keeps, so to come out on top is very pleasing. Jones’ next major event will be the opening round of the CIK Stars of Karting, where he will be competing in the Pro Gearbox (KZ2) category, in Ipswich, Queensland on February 26/27.